The Graduate School will host Three Minute Thesis this spring, a competition showcasing graduate student research. Qualifying heats begin in late February and will culminate in a Final Round on March 16 (Wednesday) with a first prize of $1,000. 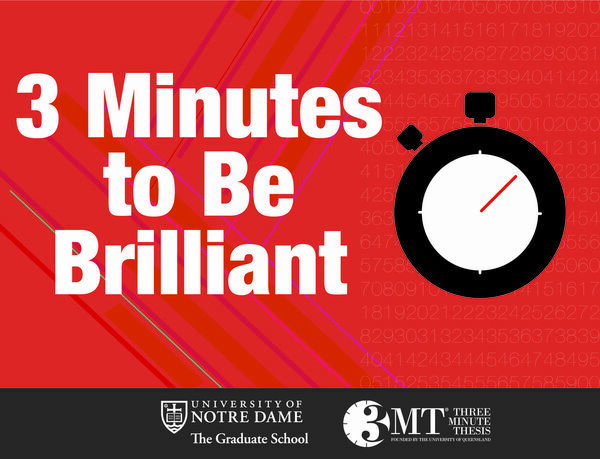 The goal of the 3MT competition is for Ph.D. students across all disciplines to explain their research, its breadth and significance, in a language appropriate to an audience of specialists and non-specialists alike, all within three minutes. Competitors must address a live audience and a panel of judges. Their presentations must be accompanied by a single static slide. 3MT will be a venue for graduate students from various disciplines to interact with one another and discuss their research and its implications. Additionally, the competition provides an opportunity for undergraduates, alumni, industry partners, various on-campus departments and institutions, and the community to be exposed to the high-level, cutting-edge research being performed at the University of Notre Dame. Laura Carlson, dean of the Graduate School, adds that, “Like TEDxND and the McCloskey Business Plan competition, my hope is that 3MT will ignite graduate students’ passion for discovery across disciplines, and foster a greater sense of community." Although the competition is the main event, preparation for 3MT informs the content of several professional development workshops dedicated to developing confident, articulate scholars throughout January and February. “Distilling Your Scholarly Research” and “Improvisation for Scholars: Utilizing Improv Techniques to Connect with an Audience” are examples of workshops offered in association with the competition. The Graduate School also provides sessions for virtual one-on-one coaching. Visit the 3MT website for more information on competition rules and deadlines. 3MT is an academic competition developed by the University of Queensland, Australia, for Ph.D. students, launched in 2008. Since then, the competition has spread to 19 countries, with more than 35 research universities participating in the United States alone, including Cornell, Carnegie Mellon, and the University of Iowa. January 19 & 20- Information Session – 5–5:30pm – 119 DeBartolo Hall – Light Refreshments will be served. Students may register for workshops at the Professional Development events portal. Students may register for workshops at the Professional Development events portal. February 22-25 – Qualifying heats will be run within each Division (Science, Engineering, Social Science, and Humanities).